Eurotour of 2014 Part 2. The journey from Wiener Neustadt to Maribor is straightforward, without even a problem with a short connection time between trains before crossing the Austria/Slovenia border. I was rather pleased about that, as the next onward train was three hours later. The cross border trains are timed to meet the trains that connect with long distance arrivals into Graz, so it may have been held if there was a problem, but I always tend to worry. 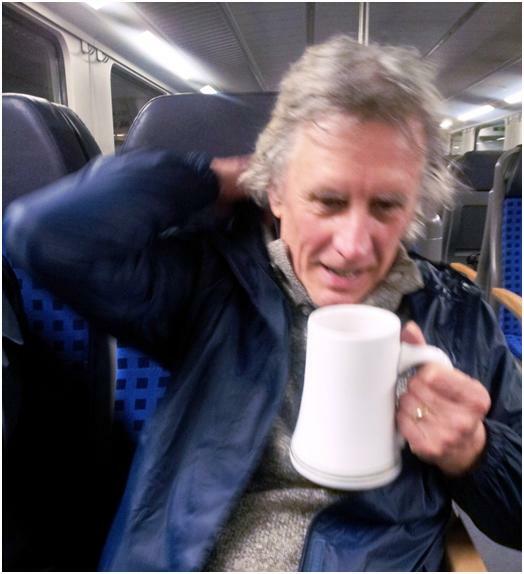 As I boarded this last train, I met up with Stan who had been to my original choice for Monday, Nöttingen. He had managed to get a train from Graz thirty minutes ahead of mine, although the timetable connection had put him on the same train as me. 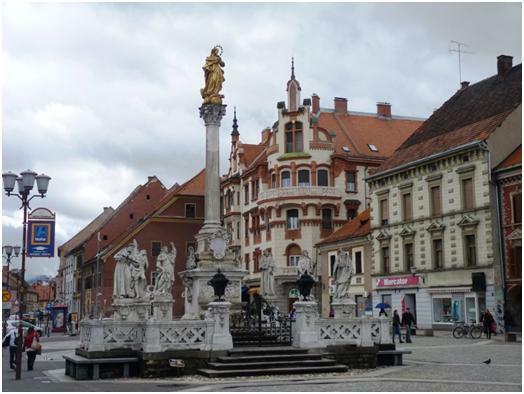 Maribor is in Slovenian Syria (Stiermark in German) which shares a close affinity with the Austria region of the same name. As you can imagine this area has swapped hands on many occasions in the past. 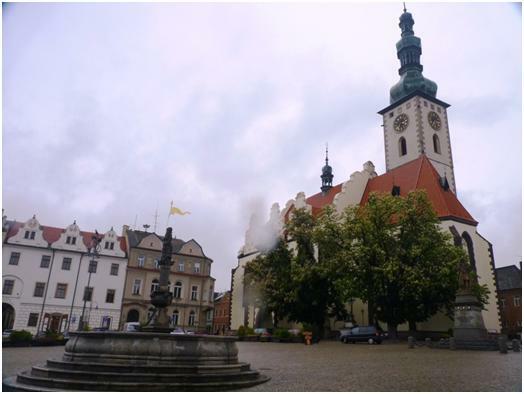 Much of the historic centre was built when it was part of the Austro-Hungarian Empire. At the end of the First World War, Maribor should have ended up Austrian as it had a large majority of German speakers, but the Slovenians took the city by force (with little resistance according to their historians). Even though the population had changed within the next two decades to a majority of Slovenians, the mere fact the city had been ‘taken’ in the past meant it was quickly annexed by the Germans in the next war. At the end of the war, it returned to Slovenia, which of course was part of Yugoslavia until it started to break up in the early 90s. The city is easy to navigate, the centre lies around a ten minute walk from the station, and all the main historic sights are then within a short walk. Almost everything important is on one side of the Drva river, a major tributary of the Danube. Both Stan and I had booked into hotels in the centre. 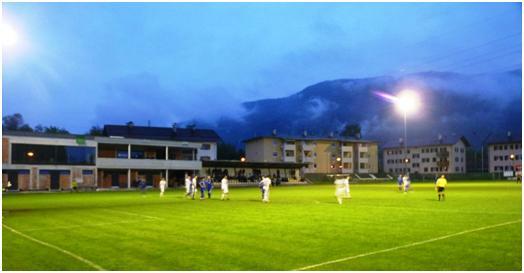 The football ground is just outside the central area, only around a 5 minute walk from the hotel. I was also pleased to note that within a stone’s throw (from a good thrower) of my hotel, there was a local brauhaus, while just down from where Stan was staying, a bar was selling beer from the Human Fish Brewery, billed as “Solvenia’s only craft brewery”. Please do not ask me what a craft brewery actually is? We went to the Brauhaus before the game, and sampled their green and dark beer, while also enjoying a meal. The green beer was exceptional for its colour, but not its taste. It seemed little different from a good lager. The dark beer had much more body and flavour to it, in the style of schwarzbier, (as opposed to Altbier) in Germany. The food was very good and so we set off to the stadium feeling well sated. 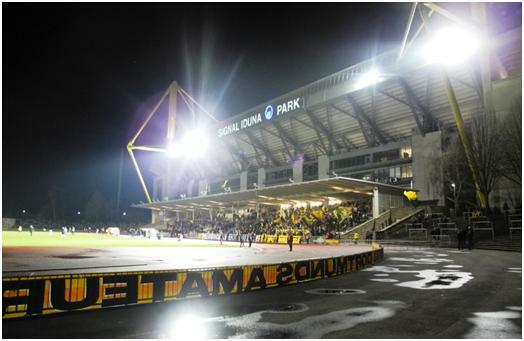 The stadion Ljudski Vrt has a quoted capacity around 13,000. They claimed that they might have been able to fill it for a championship defining game, but the crowd would be affected by big student party in town. I thought this was getting excuses in first. As we discovered, Slovenian suffers from a shortage of vowels, and so they have appropriated the letter “r” as a vowel, giving it the sound “er”. I did not ask how this affects the scrabble board in Slovenia. The old and main stand of the ground has a metal roof with the main support from a single curved concrete beam Viewing lines were therefore very good, but I noticed some patches inside suggesting that water had leaked through the roof. Considering it had the potential to hold a large number of spectators, it was lacking for creature comforts – refreshments were available just outside, while the toilets were in the sports hall of an adjacent building. The rest of the ground has been recently renovated, it is all seated, and sheltered by a single wave form roof with high points in the centres behind each goal and opposite the half way line. The roofing was boxed in with semi-translucent plastic material, meaning the supporting beams were not visible. From the outside, there were minimal steel supports above the stand, but this was not to be seen from inside giving a very pleasing effect. The name of the stadium was written against the flat ends of the roofing. The floodlight pylons were tall and in each corner of the ground. These all leant in towards the pitch at a frightening angle, considering there were no forward supports or cable ties – so that all the stresses were carried by the main steel tube. Triglav set their stall up in a defensive formation 5-4-1 with nine players behind the ball and trying to catch the home team out on the break. It was the correct policy as they did get some chances in this way, but after 17 minutes, Maribor found enough space for their Bosnian striker, Nusmar Fajic to put them ahead. The surprise came on 31 minutes, when a break saw Adjin Redzic running clear of the home defence. To almost everyone in the stadium (including me, but not including the linesman), this appeared offside. I have since reviewed the video and have not changed my mind. The linesman does not have an option to change his mind now. Still, Fajic restored the home team lead a few minutes before the break. I thought Maribor were the better team and would have expected them to increase the lead after the break – but two events stopped this. Their Brazilian defender, Soares Bordignon Arghus received his second yellow card just six minutes into the break and then on 70 minutes Fajic came within inches of completing his hat-trick with a shot across the goal that hit the post. Unfortunately for Fajic, he pulled a muscle in doing so, and was substituted a minute later. With their main creative influence off the field, and down by a man, Maribor pulled back behind the ball. Triglav really wanted a point from this to keep their chances of staying in the division alive, and attacked in some force but with no fortune. Maribor still had occasional breaks and should have scored just before the end. Their player had one defender goal side when the ball was played through, but his effort was still ruled offside. This time the linesman was right – the Triglav goalkeeper had hared down the pitch to try and assist with the attack, so one defender equalled one person, not the normal two. 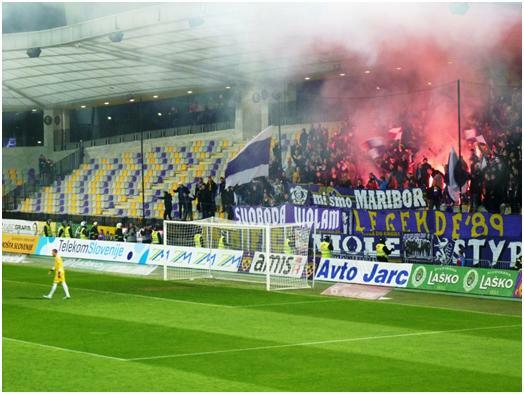 The match finishes 2-1, and Maribor can celebrate their 12th title, (in the league’s 23rd season). Triglav still have a chance to escape the drop, but this would require at least one win in their remaining games, and a play off. Our second Slovenian game involved Novo Mesto, which translates as New Town. 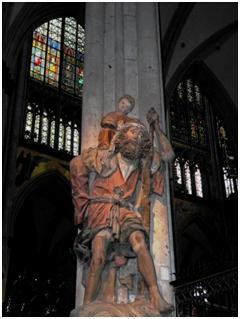 Now unlike Wiener Neustadt which dates back to 1191, Nova Mesto is really new, being founded by the Habsburg Duke Rudolph IV on 7 April 1365. 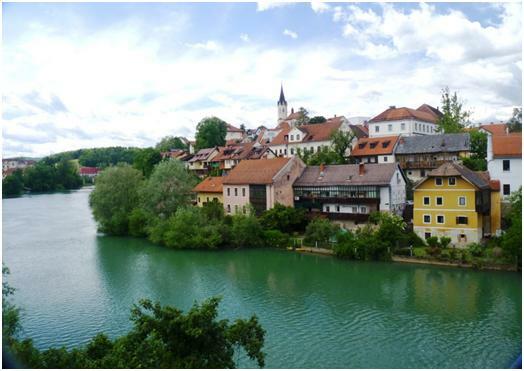 The Duke was a little egocentric and wanted his new town called Rudolphswerth, but the locals did not agree with this and always referred to it as Novo Mesto. The town sits on a bend of the river Krka (another victim of the great Slovenian vowel shortage). To get there, we had a journey involving three trains, but the connections all worked to perfection, with time for a quick beer at the first change. Our beer of choice for the day was Lasko Dark. This is advertised as a Dark Lager, and has the caramel taste familiar to mild drinkers in the UK. Maybe because of this, it appears to be a relatively light (in strength) beer, but actually is 5.7% ABV. Novo Mesto has three railway stations, but most trains call at all in turn. We elected to get off first at Novo Mesto – this is well outside the town, but the maps suggested it was more built up as a station and we were looking for somewhere to leave our baggage. A good choice, for although there are no lockers at the station, it is manned all day and we were allowed to leave our bags in the station office. This was done fast enough to get back on the same train to Novo Mesto Center, which turned out to have just a small ticket office (which was closed). Center is the best station to see the town itself. The town is worth seeing with an Franciscan Monastery, notable for a spire that has gone rusty, and a cathedral, a pleasant main square (which is not square, but actually a widened road), and good views from the breg (a former defensive wall, now small houses). We stopped for a beer in the square and ended up taking the river side walk from Breg to the ground. The River Krka at Novo Mesto. The Breg is the line of houses not on, but above the river. The ground is just across the river from the main town, and can be reached by crossing the bridge by the railway, or a footbridge close by, but on a much lower level. We used the footbridge. The ground consists is part of a multi sport venue, with a track around the pitch. As the land slopes away from the river, it has been levelled out giving a good viewing areas on the far side to the town. A few hundred open seats have added on this side. 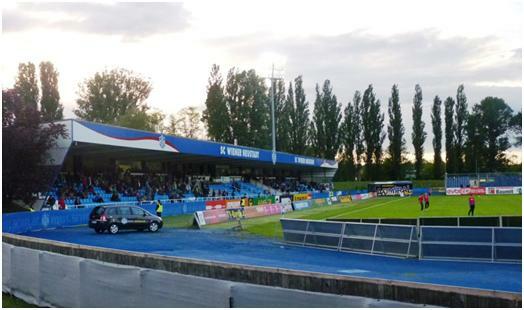 New facilities have been added to mark the club’s promotion to the top league, with various gantries for TV and radio commentary, and a new VIP area, 50 extra seats with a roof. As even this area has no back or front, I am not certain how well the VIPs are kept in worse weather, but they were OK on our visit, with bright sunshine enjoyed. Kick off was 5 in the afternoon. There are no floodlights, so a later kick off here is rare. I believe the football club has always been known as Krka or Krka Nova Mesto, but it was notable that there main sponsor was the Hotel Krka, (a plush four star hotel near the central station). The game commenced with Celje, one of the ever presents in the Slovenian League’s top division in 8th place, 6 points ahead of Krka in 9th. Triglav, who we had seen the day before were in last place and could no longer catch Celje, but they were only one point behind Krka. After the day’s action there would be two more league games, with the team finishing in 9th facing a relegation play off. The game is does not start as the most exciting, while it is a sunny day, there is a strong wind blowing across the ground and this is affecting the play. AT the end of the first half, Krka are 1-0 up, but it is a shaky lead. Celje have had more of the ball but have struggled to control it and test the home goalkeeper. It is past midway in the second half when the action starts to hot up. Celje finally achieve something, and their man is bought down in the area, Verbic takes it, but Obradovic in the Krka goal proves up to the task with a fine save. We have to wait twelve minutes longer for the scoreline to change. Carevic, for Krka swings over a corner from the right (into the wind), it goes over the keeper and hits the far post, bouncing in for 2-0. The game is not over though, as with two minutes left on the clock, Obradovic fouls Verbic. This time the penalty is taken by Gobec, and is scored for 2-1. In the final minute, a cross comes over and Verbic gets a good header to the ball, Obradovic pushes the ball out to Jovanovic. Jovanovic shoots but another save, with the ball coming back to him, his second shot is also saved and the ball bounces back to Verbic who finally forces it over the line. Cue a massive protest, first indication from the referee is goal, then he talks to his linesman and it looks as if there may have been an offside. Finally he decides the goal stands and in the meantime, three players have been booked. I have seen the video on the league website, but it is inconclusive about whether Verbic was offside when the initial cross came in. This was only national league game I have ever seen with the Europa League six officials in use, (the previous day’s game only had the standard number). The extra two officials appeared to have no input, except as someone else the players could scream abuse at when a decision does not go their way. Obradovic saves a penalty from Verbic (7). Only six officials, still not enough to notice how many players are encroaching. After the game, a good meal was had, along with more dark beers at the Loka, a restaurant just across the footbridge from the ground. We then made our way along the riverside footpath to Novo Mesto station and picked up our bags for the late train to Ljubljana. From there it was the overnight to Munich, and after an hour’s stop for a light breakfast, onto another train. I left this at St. Gallen, just over 12 hours after leaving Novo Mesto. Stan travelled on to Zurich and then changed trains to Thun. One oddity about the train from Munich to St. Gallen. After leaving its final stop (Lindau) in Germay, it reached the first stop in Switzerland (St. Margrethen) some twenty minutes later. This is self is nothing special, but in between the train stops at Bregenz (Austria). Are there any other train routes that stop in three different countries in twenty minutes? 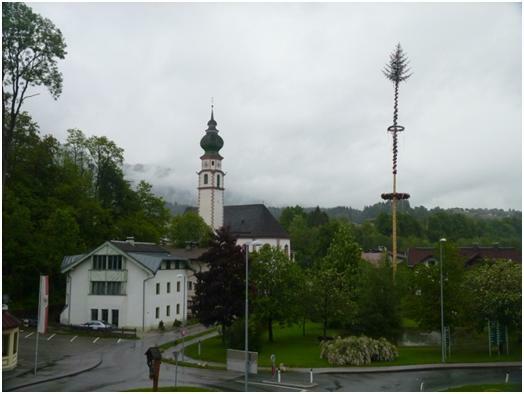 After two sunny days in Slovenia, it was dull and grey in St. Gallen, if not actually raining most of the time. The city which dates back to the 7th century does not call itself “New”, the disadvantage with Switzerland is that it was always an expensive country when you could get over two Swiss Francs to the pound. Now at under 1.5, it is very expensive. My general budget for the trip is around €50 per night for hotels, which in most places means I can get en-suite, but for 70 CHF (about €60), the room has a sink only, a lavatory down the corridor and a shower on a different floor altogether. The city is interesting, but the famous library appeared closed to the public, although I arrived during the time period in which the sign said it should be open. Later on, I meant up with the FC United fan known from the Kempster forum (http://www.nonleaguematters.co.uk/forum/gforum.cgi) as Oftenscore6. We had a quick beer in the town, and then headed out to the stadium, taking a second beer in a bar close to the station just down from the stadium. The Stadium itself is built above a shopping centre, but there is no evidence of this from inside. Three sides are a single tier while the fourth side has this interrupted to provide the business seats and boxes, in plentiful supply. The attendance for the game was 11268, almost the same as when I went to the old ground – but this season it was for a nothing game at the end of the season, while at the old ground I was part of a capacity crowd. One end of the ground is standing, but with all the talk of “safe standing”, I was certainly not convince by this one. At German new builds and conversions, the standing areas are meant to be convertible to seats, and every row of standing has a barrier in front of it. Here, the steps of the terrace are very high, there is only a barrier on every third row. If and when someone trips, then there is a good chance that of a serious injury, maybe several injuries as one person bumps into another. I would not like to be in there when the terrace was so crowded so as there was more than one row of people on a step. In addition, there was no stewarding to stop people from staying on the steps leading up and down the terrace, (these were crowded with those who had decided they provided good viewing point). The lack of hand rails when you were climbing up or down only increased the risk. To stand it cost CHF25 – slightly less if you pay in advance. Seats along the sides are around twice this. While the top teams in Switzerland are now capable of matching the best in Europe, (I saw FC Basel get a draw at Old Trafford, and that was wile Ferguson was still timing the games), this quality does not even stretch to the bottom of the division. 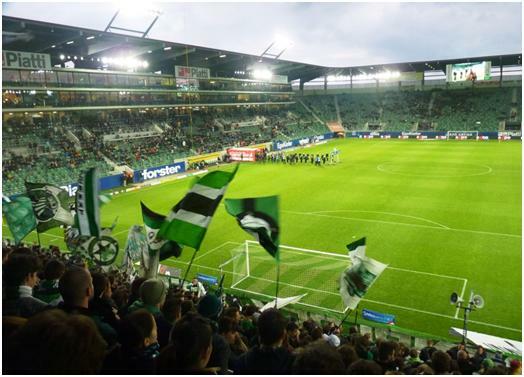 With both teams safe from relegation and neither at risk of qualifying for Europe, St. Gallen just wanted to close the home season with a win to keep the fans happy. Sion were never likely to actually win this match, but they put up a good resistance for almost an hour. It looked like a catalyst was required to break the deadlock which was threatening to kill the match at 0-0. This was provided by Sion right back Vincent Rüfli, who picked up his second yellow card just before the hour. Within two minutes, Roberto Rodriguez attacked through the gap left by Rüfli and slotted in the opening goal. After a decent amount of celebration, the game went quiet again, especially as despite Rodriguez continuing to appear to be St. Gallen’s most potent attacking option, he was substituted on 76 minutes. Right at the death, though we had a second goal, through Matias Vitkieviez. The fans behind the goal, who had never stopped singing, or blocking the viewing lines with their flags all went home happy. The small number of Sion fans, fenced in to the far corner went home unsurprised, (they are second bottom for a reason). Inside the ground, refreshment was by card, and Jim had to go back to the ticket office as we left to reclaim CHF1.50 left on his card. The organisation was good, and this was quickly dealt with and we just as quickly board the bus back to town, where a couple more beers were found before we went back to our respective hotels. Friday was another day ruled, but not completely ruined by the rain. I boarded the train out of St. Gallen just after 10.30 changing at Buchs and Innsbruck to arrive at the small Austrian town of Kundl some four hours later. It actually was not raining as I left the station and started to walk to the hotel. It took just 15 minutes to get to the hotel, and I was soaked when I arrived. Kundl is a small town on the river Inn. There was enough respite in the rain shortly before kick off to allow me to quickly wander around. It is small and unexceptional, but has quite a bit of industry with a chemical works and a timber company. It is the latter which is the main sponsor of the football club, changing the name from SC Kundl to SC Pfizer Holz Kundl. I actually stayed just over the bridge in Breitenbach-am-Inn. The two towns would not have had much to do with each other until the late 19th century when the community of Breitenbach realised they needed a better link to benefit from the prosperity that the railway line had brought to their neighbour. Breitenback am Inn – viewed from the hotel! They are building a new dressing room complex, so at the moment, I think the dressing rooms are in the neighbouring swimming baths. At the entrance end, there is catering – one window for drink and one for food, but you have to buy a ticket for the food at the drinks counter! 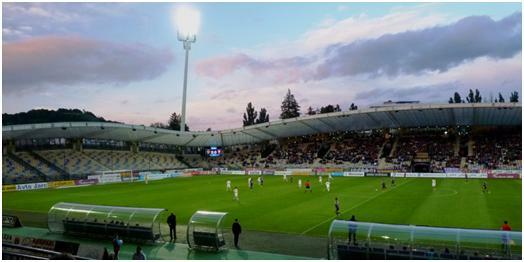 The stand is small, three rows of seats (about 120 seats), a row of standing at the back, and just a path (no barriers) between the seats and the pitch. One has to approach it over rough ground in front of the building works. The announcer was upstairs in the not completed building. Once I started asking around, they came up with a copy of the teamsheet. A simple four page A5 programme was given away on the gate, but did not include the line ups. The far goal, and the swimmng pool side appeared to be quite tight between pitch and perimeters, but there were rails around most of this (some gaps towards the corners), and I imagine that anyone who delighted in standing in the rain could go around there. Both sides set up their stall by missing good chances in the early minutes. Reutte then appeared to take control, and put in a few distance shots, but could not work anything of worth. Kundl did not manage a shot on target in the first half. Not at all good as one of their players was bundled over in the area just before half time. Of the four penalties I have seen on this tour so far, only one has resulted in a goal. Kundl were a little better in the second half, Reutte a little worse – so most of the action was at the same end as in the first half. Kundl did have some shots blocked, but most shots from both sides were well off target. The result was clear well before the end. Saturday, and I am back on the rails again, with another long hop, taking the train from Wörgl (which is the next stop beyond Kundl) to Vienna, and then changing for Breclav. It was actually not raining when I arrived and walked to the ground. I should not have considered that to be a good sign. The walk was worrying, despite having done some good homework before travelling and even checked the game at the last possible moment with on train internet, (this lasts until arrival in Vienna). While walking to the stadium, I came across another one, with my club name on the gates, which were clearly closed! Even walking down the road that I had the ground listed as, it all seemed quiet, no one around at all. But then as I rounded the corner, I spotted the away team coach and the other stadium. Trida 1. Maja – no football here! The one I passed on the way turned out to be Trida 1 Maja, which is used by some of MSK Breclav’s other teams, but not the first XI. It has a very old stand, and also a two sided cover between the first and second pitches. I later noted the name Slovan Breclav, so it is possible there is a lower league team using this as a first team base. 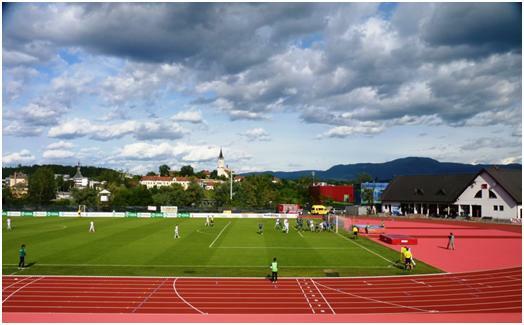 The main stadium is Lesni, about five minutes further from the town and station. I walked through the town en route and saw little of interest. 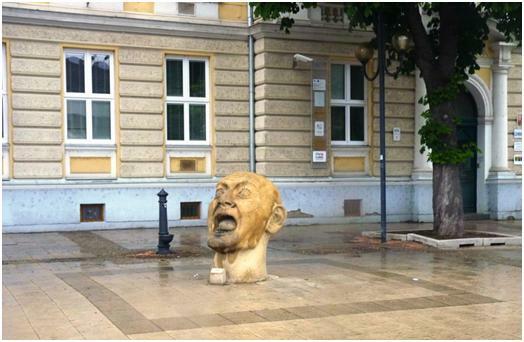 Just an odd statueless head by the park by the station. The tourist office was closed, but then this does not look the sort of place that attracts weekend tourists, (or indeed any type of tourist, except those who read and write blogs like this). Last week, MSK Breclav lost by 6-0. As a way of apology, admission charges for this game had been dropped. Looking around, I think the apology was not accepted by the people of the town. I counted 140 in the ground. 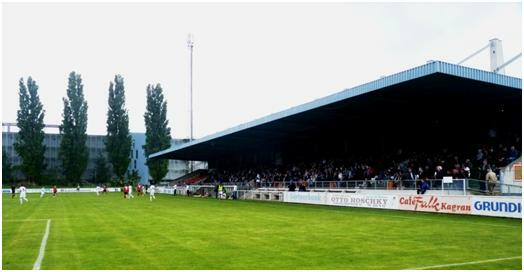 The “main stand” is on the left as you enter the ground. This is a curious tall narrow affair with two tiers. The upper tier has just over 100 seats, while the lower one (still upstairs from ground level) has 64 with more space, and is labelled for VIPs. It helps that this one backs onto the stand and club office. I invaded temporarily, and they were happy to let me have a copy of the team sheet, once they could get their printer working. Opposite this is the old stand, a lower longer affair containing at least 500 tip up wooden seats. More seating has been added behind the goal where you enter atop the rather old concrete terracing. These are not covered and were not getting much use on a day where rain was threatening up until the point, half an hour in, when it arrived. The far end is a flat path, separating the ground from a second, 3G surface. There are also a couple of clay courts, which I thought were for Tennis, but the nets were raised high, so either volleyball or badminton. There is a wide grassed path between the old stand and the pitch, suggesting there once might have been a track, although the end terracing appears to close to allow it, and is not curved. The terracing may only be a couple of steps, but does not appear to be a recent addition. If Breclav were trying to atone for the previous week, then the first five minutes did not help. Two shots from 1. HFK Olomouc and they were 2-0 down. After that, the first half settled down somewhat. Olomouc were clearly the better team, passing better and more organised in defence, but a couple of reasonable saves, a couple of missed shots and the score stayed 2-0 at the break. Breclav did try, but their long ball game was easy to defend against, and they fell into the offside traps rather too easily. The second half started in the same way as the first – the first two Olomouc shots were scored. Again, the game settled down for most of the half, interrupted by continual substitutions. We did not have rolling subs, but the teams were allowed more than the standard three. Both in fact made five changes. With three minutes to go, Breclav’s Ondrej Lysonek was in a clear offside position, but as the ball run wide to the winger, there was no immediate flag, and the linesman somehow neglected the flag when the ball was crossed back in, and Breclav got the score back to 1-4. Despite ten substitutions, not one second of injury time was added – I think the ref had decided he was wet enough, and so I started my wander back to the station, pausing only to take a couple of photographs en route. Prague has a lot of football teams, no less than four in the National top division, three at the second level (although two of these are liable to be relegated),and numerous clubs at lower levels. Not only do these tend to have their own grounds in generally easily accessible suburbs, but they all attract a few spectators in their own right. Many have a fair history, once you can unravel the various name changes, mergers, insolvencies and reformations that have occurred. And of course, many kick off in the mornings (generally Sunday, but a few on Saturday as well). My hotel was adjacent to one such club, Viktoria Zizkov who were indeed kicking off their Division Two game early on the day after my arrival. I have already been to Zizkov, and even though it was nearly 20 years ago, I wandered past the stadium – where locals were already entering the ground, took the tram for one stop, and the metro for four to Kobylisy. I had not noticed at the time that the tram from my hotel would in fact take my all the way, but that would have taken a significantly longer time. From Kobylisy, a short walk up Na Pecich gets you there. If you are not heading up hill, then you have turned the wrong way. A nice clear gate with the name above it, it cost 40 Kcs to enter and an extra 5 for the programme. The ground almost certainly once had a track, (possibly only ever grass though), the wide gaps between the spectator areas and the pitch give this impression of this, but it will have been lost in a remodelling of the stadium. A small size 4G pitch has been installed above one end of the ground, and that end now has a four meter high wall, dangerously close to the end of the pitch. I would estimate (based on the positioning of the terrace and stand), that the main pitch has moved south between 10 and 20 meters to allow for this. One side of the ground is old and very steep terracing. The other a good sized stand. Behind the goal is a flat area leading off to the football dressing rooms, food and drink and even a restaurant, which had a notice on the door apparently celebrating that Admira had won the Prague skittles championship some five years ago. Sadly the doors to this area were closed, so I could not see if it included a skittles alley. As with many sports clubs in this part of the world, the complex also includes a couple of clay tennis courts. Judging from the weather, I elected to start to watch the game on the open side, but switch to the seats at half time, when I thought it could rain. In fact it started earlier than that. 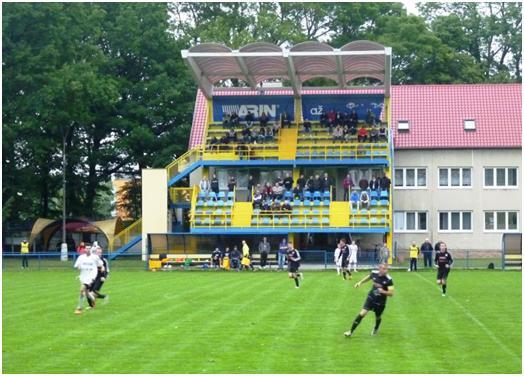 Both teams were comfortably ensconced in mid-table of the Ceske Football League. 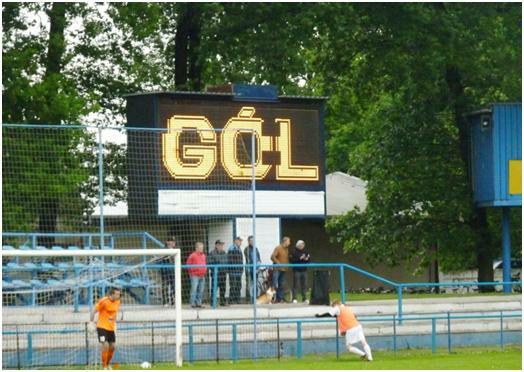 Football in the Czech republic has two national divisions, with the third level split between Ceske (as in Czech), and Morovskosleski (Moravia-Silesia). The fourth level has five divisions, which must make things more complex. I believe in normal circumstances, the number of teams relegated are variable to keep the division sizes standard without moving teams between regions. 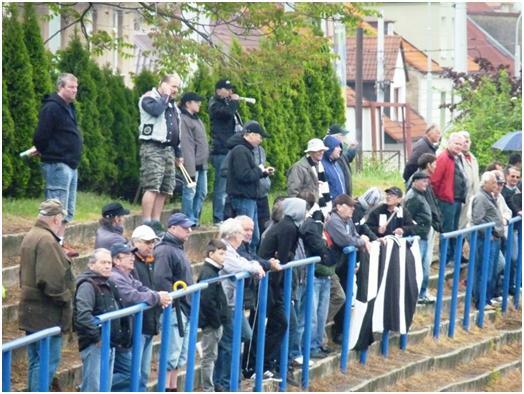 This season could be a case in point as both the teams likely to be relegated from Division two are Ceske, in fact both Prague based. Anyway, there are a couple of park benches atop the rather narrow steep steps of terracing and here I settled for a very enjoyable first half. It did not take long for the visitors, Stechovice to take the lead, but Admira restored parity with a good headed goal following a corner. On the half hour mark, Admira took the lead, but this was pegged back to level six minutes before the break. At the same time, my idyll on the open side of the ground was broken by the first few spots of rain. I braved it until the break, and bought my half time coffee before taking shelter for the second period. Again, Admira took the lead, and again Stechovice levelled the scores, before the away team decided to shut up shop and made some time wasting substitutions in the last three minutes. This time, two minutes of injury time were added (four substitutions used). Neither team used more than three substitutes, but there was an indication more were allowed, Stechovice had a fourth sub prepared to take the field, but the final whistle went before he could come on. Walking down to the metro station, I was now needing to use my umbrella, but decided to change it when I saw replacements in a shop near the station. The lesson for the day is if you buy an umbrella for about £1.50, it may not be the world’s best design, but it worked for the day at least! So metro back to the main station, and on to the city of Tabor. 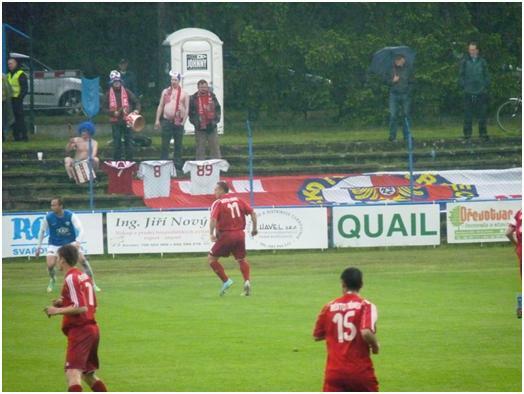 When I did a travel search for the connection to Sizimovo Usti, where FK Taborsko play, the system came up with an extra hour before leaving Prague, and arriving just 40 minutes before kick-off. This would be plenty of time to walk to the ground, but I decided to spend my hour in Tabor. This is a relatively pleasant town, with a small old town that would be worth exploring a little on a dryer day. I still made my was to the centre, and not at all to my surprise, found there were frequent buses between the towns. This served me in two ways, firstly I could arrive at the ground earlier, and secondly the walk from the bus stop was only half the distance as from the rail station. I used the time honoured method of watching to see what stop other passengers wearing football scarves left the bus, and then following them – admittedly now with the Sat.Nav. to confirm that this was working plan. FC Taborsko are top of the Czech second division, but in a close battle with Hradrec Kralove and Ceske Budejovice for the two promotion places. The club has only taken this name for two seasons, after merging with (absorbing) the Tabor club who actually played two divisions lower than Spartak Sezimovo Usti. 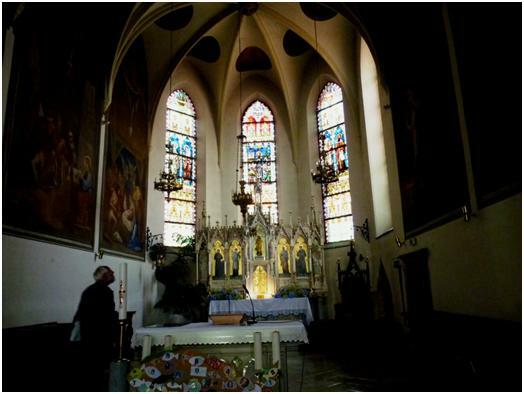 This is unusual, as it is the owner of Sezimovo Usti, that led the transfer. Normally in these respects, the small team (at least in league position) takes the assets of a higher level (but financial struggling) team in order to gain an unearned promotion. 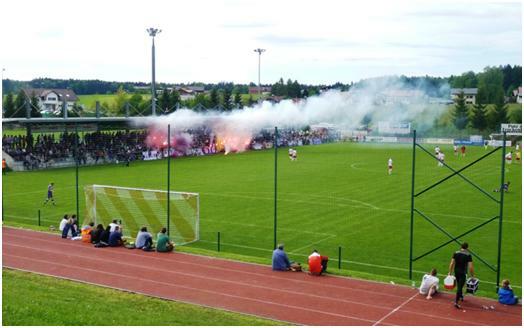 This is common practice in the Czech Republic, and even the fans’ team at Bohemians Praha were not above using the method. The town of Sezimovo is the base for engineering company MAS Kososvit and very little else. The ground is arrived down a path between fields and woodlands beyond the edge of town. I was shocked at how poor a venue it was for this level of football. 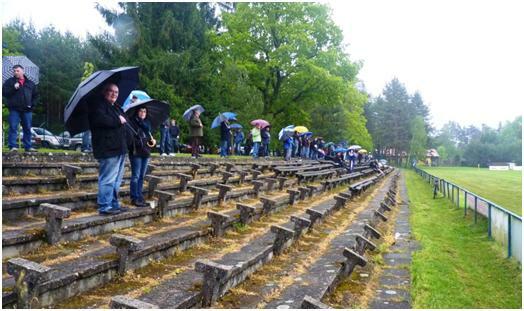 It consists mainly of an old stand, in which around 500 plastic seats have been bolted to old wooden benches. There are still three rows of benches in front of this, but these have a very poor few, and even less protection from the rain than a stand with many holes in the tin roof. Opposite the main stand is terracing, old and bedraggled, it was once bench seating, but anyone sitting on this is taking their life in the own hands, (or at least risking splinters in their posterior). One end was access to dressing rooms, club rooms, etc, while the other end had was completely open. The ground has a grass track, not marked out, but sections showing enough wear to suggest recent use. A small section at the far end of the open terrace was fenced off for the away fans. Four of these were wearing colours and were very drunk. I saw them catching the train from Tabor to Prague afterwards, meaning they would not get home until after 3 am. They were not, in any sense of the word sober, or likely to be so in the near future. They did have a number of tickets for the game, presumably complementary from their team, and as their support was not enough to use all the tickets, they were giving them away at the gate. They did not even want the 50 Kcs price tag, so my cost was limited to 10 Kcs for a programme. Incidentally, the away contingent included two more fans I did not meet, a total of six. Four security guards kept them in order! There is a small section in the stand reserved as “fan club”, and hear the home supporters singing section were based, along with their drums and a couple of trumpets. We ought to bring more brass instruments into English football, I am sure it would improve the atmosphere. Of course, at Cheltenham I think a flutist may be a more appropriate addition. It is not as if we would drown out the music. It was notable that for this game, the fans sang in support of Sezimovo more often than they did for the current name of Taborsko. It took me a few goes to ask the question uppermost in my mind to someone who spoke English. “What will the club do if they win promotion, surely there is no way this ground can stage football in the top division?” The journalist I spoke to confirmed this. His first words in reply were “That is a question”. It is quite clear that I am not the first person to pose the question. 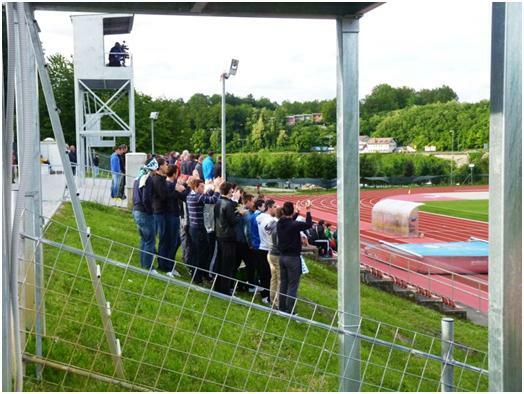 The answer is less clear, but a groundshare at Pribram seems the most likely of solutions if they are in the higher division next season. The one remaining match to be played in Sezimovo Usti in this case is the game against Ceske Budejovice on 1st June. This is about the closest thing Taborsko have to a derby, and it could be a promotion decider. One expects the visitors to bring more than six fans with them. 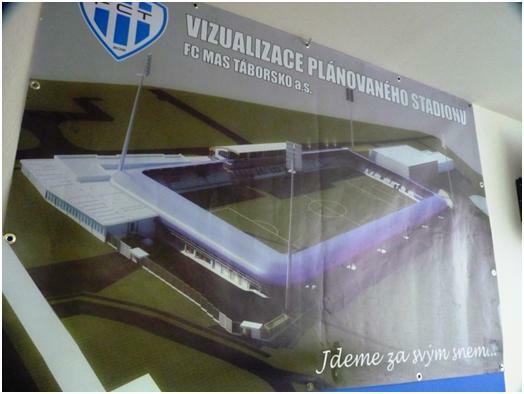 The long term plan lies in a proposed £2 million stadium, which they would like to build in Tabor. I would imagine that the idea of moving to the larger neighbouring town (it’s a 15 minute bus ride) is the main reason for the merger of the teams two years ago. However, the plans are still very much on the drawing board. They still need to get planning permission if it is to ever happen. 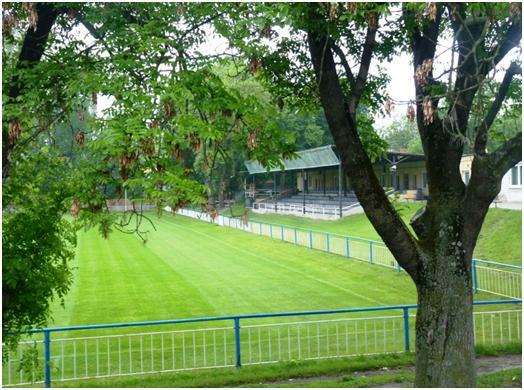 In England, there would be massive opposition to building a new stadium on a green field site, (I think it is the old ground in Tabor), but in the Czech Republic, it will be down to politics and personalities. And so to the game. I had needed my umbrella while walking to the ground, and it rained during most of the match, on top of heavy rainfalls in the previous week. The only description I can apply to the pitch was waterlogged. There were no puddles or surface water, but frequent splashes when either ball of player touched the ground. I doubt if the game would have been played in England, but in this part of the world they just get on with things. By comparison, one wonders how much worse the pitch must have been at Frydek-Mistek as this one was called off on the day. Despite this, there was some pretty good football played, with Taborsko always on top. Jakub Hric put them ahead on 11 minutes, and Miroslav Strnad added two before half time, and then completed his hat-trick ten minutes into the second half. This completed the scoring, despite Trinec having Benjamin Vomacka, who was both captain and centre half sent off for a second caution with 20 minutes to play. Vomacka is a player who believes that as the referee played an advantage, he cannot then come back and book him. Sorry, Ben, wrong about that! Needing to keep my plans flexible, I started with a Airmiles ticket from London to Frankfurt. Neither Airport is exactly easy to navigate, as shown by the fact I spent longer on the ground at each, than I did in the air between them. I wanted to book an overnight train for Wednesday, and finding the Reisezentrum meant going to one part of the airport station, but then walking back to the other section for a train into the city centre. I stayed at the Excelsior, almost adjacent to Frankfurt Hauptbahnhof. It is a convenient and not pricy hotel which includes the stock in the minibar (beer, water, orange juice) and breakfast in its price. With an early start on a train stopping in Achaffenburg, it may have been better to stop there, but I had already booked an unchangeable room before picking on the route for the morning. On a tour exceeding two weeks, one is bound to miss a train or two, but I had not expected this to happen on the first day – and it was all my fault. Sitting in the hotel room and surfing the net over later parts of the tour, I forgot the time difference between the computer clock and Germany. 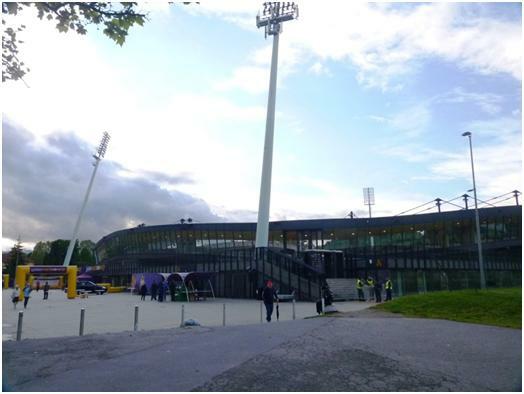 Hence my plan to arrive in Achaffenburg well before kick off and have a leisurely walk to the stadium were replaced by rushing straight in from the station, (still arriving 15 minutes before kick off). 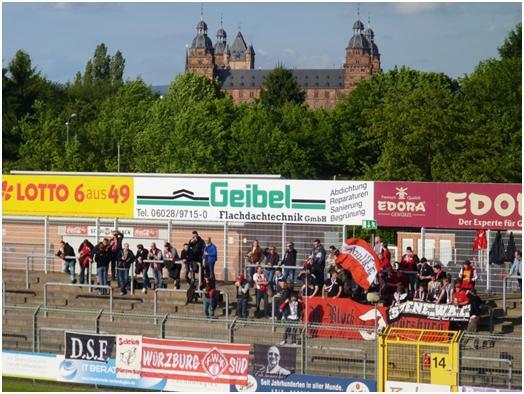 Achaffenburg sits close to the Hessen/Bavarian border, and in recent years its club, Viktoria had deserted Bavarian football for the lesser journeys in the more Westerly league. 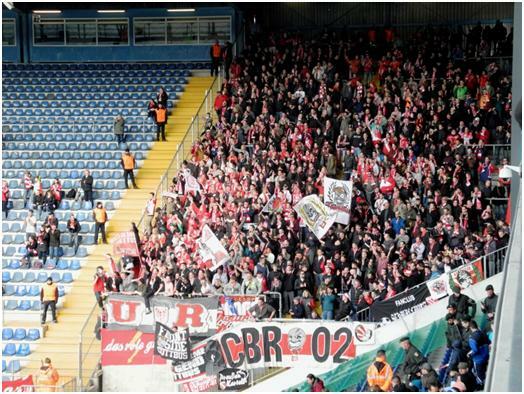 When the leagues were re-aligned two years ago, the club were faced with the choice of either staying where they were, in the fifth level Hessenliga, or taking a promotion which their league position did not justify to the new, fourth level, Regionalliga Bayern. There was a vote on it, and it was overwhelmingly in favour of the Bavarian option. Two seasons later, the lure of a higher league dominated by the reserve teams of the two Munich clubs does not look so bright. The option to switch back is not open, and so Aschaffenburg will be relegated to the Bayernliga Nord. Eight miles up the road, and still in Bavaria, Bayern Alzenau (also Bavarian, as the name suggests) play in the Hessenliga. In the Regionalliga, the closest geographical rivals are Würzburger Kickers, and this is the match I am seeing. There are plenty of police in force, but the rivalry is not backed up by years of playing each other, as the teams have been in different regions until the last two seasons. Anyway, it is hard to create animosity when crowds go below 500. 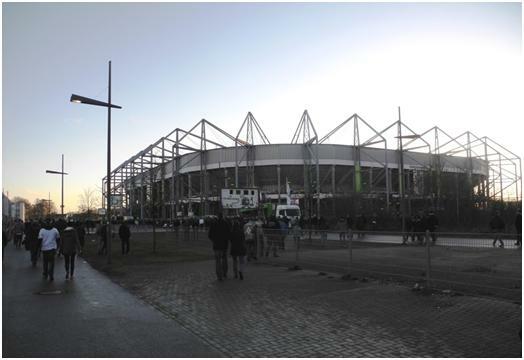 The Stadion am Schönbusch is just across the river Main from centre of the city. It has concrete stepped terracing (no cover) along one side and behind the town end goal, (where the away fans are penned in). This probably once curved around to the South side, but has been replaced by the main stand. A large construction held up by a mesh of steelwork. 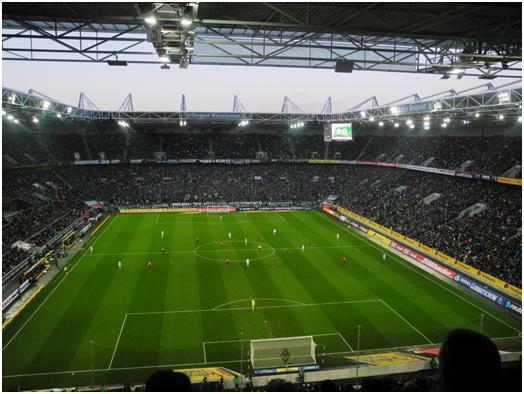 It does not look as if it has been sitting there for all the 25 years since Viktoria’s short stay in the 2.Bundesliga – but it has stood for many years, and is clearly meant as a permanent structure. 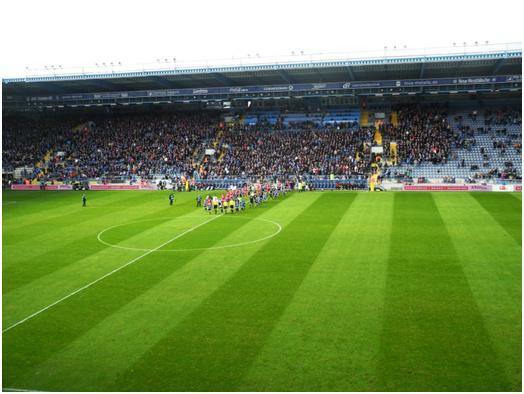 Two more, older stands sit behind the goal at the Western end of the ground with the players entering and leaving the pitch from between these. From the terracing, one has to stand at the top to see over the fences that still blight most of Germany’s grounds, so I elected to pay the extra €4 for the tribune. The seats behind the goal are at the same cost €8 as the terracing. The A4 sized programme is free and handed over with the tickets. For the team sheets, a simple request suffices. The 6.30 kick-off is proscribed by the lack of floodlighting at the ground. Technically, Viktoria Aschaffenburg were not relegated before the days starts, should they win three games, while Bayern Hof get no more than one point, and … loses all three, then they would get into the play offs. There is a lack of belief in this possibility, both on and off the pitch. Kickers have the best of the early attacks, and in particular they are strong on the right side. In the sixteenth minute, a low dive from around the edge of the area finds the target and Würzburg have the lead. Job done, the game immediately becomes comatose, and nothing of note happens up to the half time interval. At half time, Viktoria shuffle the side, switching from 4-4-2 to 4-2-3-1 and moving their small Japanese player (whose hair has an unnerving appearance of moving independently from his head and getting worrying close to reaching a resonant frequency in it oscillations) to the centre of the field. Nagakawa had been the only player in the first period who showed any flair, and by moving position he did not see the ball for nearly 30 minutes. Midway through the second half, and almost out of the blue, Guilio Fiordelisi finds space on the left wing and sweeps in an equaliser. Suddenly the game comes to life as both sides decide to enter a competition for missing the target from the best position. Naturally even here Würzburg lead the way, missing twice as many easy chances as the home side, but then as the clocks tick over to injury time Ricardo Borba messes up and actually scores the winning goal from just inside the left corner of the penalty box. With 90 minutes before my train out, I take my leisurely stroll through the town. 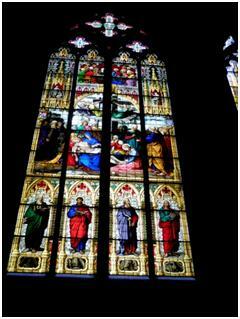 There is a pleasant old town, well preserved and kept apart from the modern shopping zone. 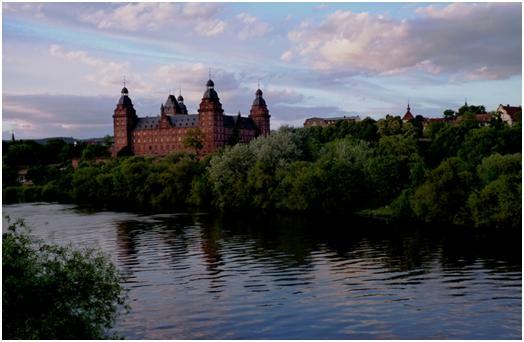 Meanwhile from any direction, including the football ground, the view is dominated by the large red block of the Schloss Johannisburg, sitting in a prime position above the River Main. The plan for this trip is to sleep in hotels whenever possible, and then travel early in the day, and Saturday involves a typical journey, leaving the hotel in time for the 07.30 off Frankfurt, heading for Salzburg with a change at Munich. The ICE provides a comfortable platform for sitting and writing up my notes so far. The train is busy but not full and I get a pair of seats without having to search. There are a few police and some Eintracht fans around, but they are not heading into Bavaria. Football support in Germany tends to be more regionalised than in England, but Bayern Munich does take support from all over Bavaria, and there are plenty of red scarves and shirts in the train, even though it arrives in the city at 11.00, four and a half hours before kick off. Then I know some Cheltenham fans who would consider this to be a shortened day as far as drinking time is concerned. Getting on the S-bahn at Salzburg, things are so quiet I almost think I am in the wrong place – then I spot about half a dozen fans bedecked in Violet colours, and carrying a crate of beer. Well, it is 12 minutes, and they would not want to get thirsty, would they? Directions from the station to the ground. One of the visiting fans asked a local at the station – he pointed upwards. This is accurate! I took a slightly longer route, to check on the village. It is small, not very interesting and very closed. The name, Seekirchen suggests a lake side church, but it appears the lake is some distance away. 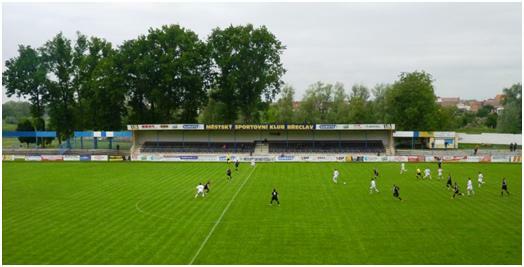 The ground is the Sportplatz, and has three football pitches, with a double sided stand positioned between two of them. There are a number of clay tennis courts, and two beach volleyball courts, as well as a sprinting track. No cricket square though. Taking advantage of being at the top of the hill, the clubhouse has been built well above the pitch level, a two storey building with the dressing rooms upstairs. There is a balcony upstairs, a terrace below (lots of seating and table for your beer), and a terrace half way down (the level with the track). A lot of people were watching from these vantage positions, which is just as well as the rest of the ground is one sided, with the stand and the top of the grass banking each side of the stand. Surprisingly there is no barriers marking off the pitch, some temporary fencing was added in front of the stand while the rest of the pitch is marked off with tape. Looking back at the records, the crowd was 350 for their last game. In England, a club like this would really need to do a lot of work before being in a league with 350 people present. 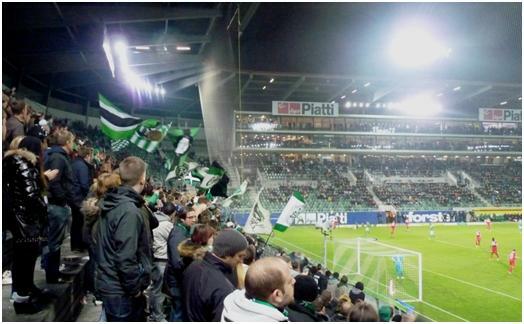 For the visit of league leaders Austria Salzburg, the official crowd figure was 1200. I would have guessed more. Admission was €10, no programme was available, but beer was. Austria Salzburg was formed by fans after the original club of the same name (founded 1933) was renamed Red Bull and changed colours. Not surprisingly, they have a close affinity with AFC Wimbledon and FC United. 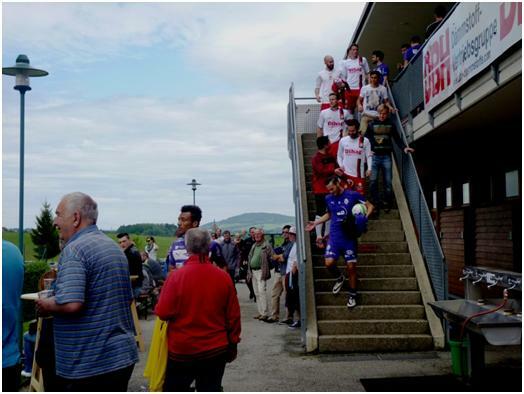 They started in 2006/7 in the seventh level of Austrian football – they won league titles and promotion in each of their first four seasons, but the Regionalliga has been more difficult and this is their third season at level 3. 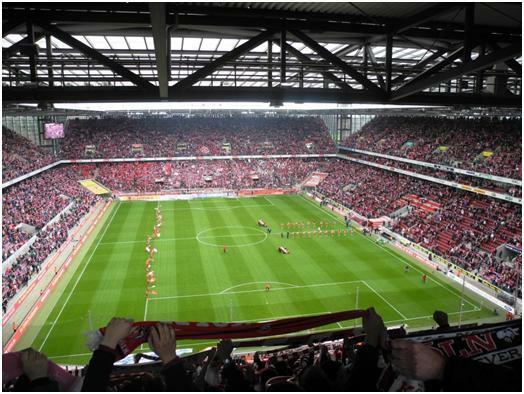 Just to rub salt into the wound, Red Bull’s nursery club, Liefering won promotion last season and now share the Red Bull Salzburg stadium. This season, Austria Salzburg have gone through unbeaten with 22 wins and four draws before I arrived in Seekirchen. Still with second placed Wattens winning the night before, they cannot take the title in this game, as a win would leave them nine points ahead, three to play. The first half of the game was played at a slow pace, which just occasional touches from either side to convince us a game was in progress. Not surprisingly, Austria Salzburg had most of the good chances, with two poor misses and two good saves from the lengthily named Matthew O’Connell-Harold, (not very Germanic, I thought). The best chance comes in the last minute, when Seekirchen send the ball across the face of the goal just inviting a touch that never comes. It would be more than 30 minutes of game time later before Seekirchen get the ball into their opponents penalty area again. In the second period, Salzburg just camp out in the opposition half. It looks like it is just a matter of time before the home defence is breached. Sometimes appearances are deceptive. This was not one of those times. On 63 minutes, Marko Vujic is given too much space on the edge of the area – his shot goes in to the top corner. The second comes from a free kick on 73 minutes, Rajic the scorer, while Onisiwo delicately flicks the ball over O’Connell-Harold with three minutes left on the clock. Ball watching – none of the players in the picture can get to touch the ball as it moves through the cameras line of sight for the second goal. I expected the visiting fans to invade the pitch at the whistle, but they all stayed their ground. None rushed back to the train though and I think I was the only spectator to the station for the first train, 20 minutes after the whistle. 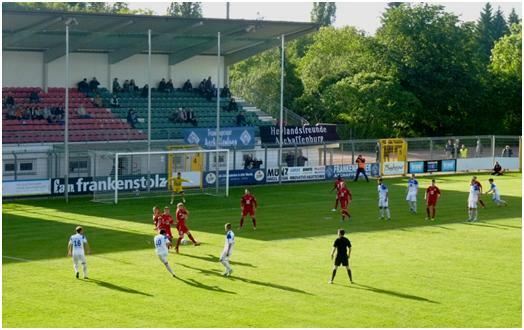 Two years ago, I had chosen Stadlau over Donaufeld as my Sunday morning game before seeing the Austrian Cup Final. The main reason for this was that it was starting a little later, and was easier to get to from where I was staying, so I could have an extra half hour in bed. Donaufeld did not feel put out by the news and have stuck to Sunday morning kick offs at 10.15. The opposition was Stadlau, so I did not have the choice this time. 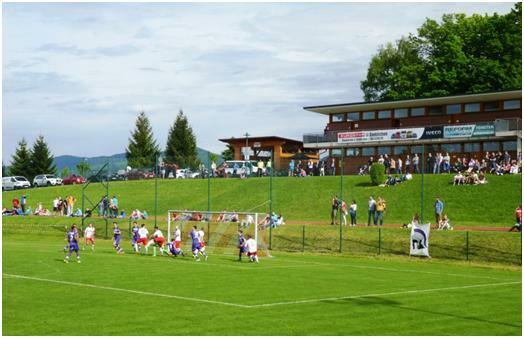 First against second in the Wiener Stadtliga, one of the nine divisions at level four in Austria. The league runs on to Mid June and there are six games including mine to play, but with a 12 point gap between Donaufeld and the visitors, there was little chance of this being a crucial fixture. The ground is relatively easy to get to, a 15 minute walk from Florisdorf station, or two tram stops and a two minute stroll. Even though my U-Bahn ticket was valid on the tram, I elected to walk there. The ground features a large and relatively modern stand along almost the entire length of one side. Eight rows of bench seats and a small announcers’ box where they were happy to let me view the team sheets. (€7 to enter, no programme). There were a couple of stalls selling food, drink and tombola tickets by the entrance and a small bar/clubhouse with a lot of photos of the team. It is notable that the have clearly one the Stadtliga several times in the past, but there is no mention of any honour at higher or lower levels! There is a second pitch behind the main stand, but this has now been fenced into two mini pitches. As a sports club, it also offers a couple of clay tennis courts. It started to rain just as I arrived, and rained (often heavily) throughout, so I only ventured away from the stand to buy half time refreshment. A few people stood under unmbrellas in this area, but no one watched from the other sides. There was no access in front of the monolithic dressing rooms at one end, and I did not investigate whether one could access the far end through the stand (and then walk on to the far side). The game was not a classic, but was also not dull. Neckam made several fine sides to keep Donaufeld at bay, but the best chance fell and was missed by his teammate, Philip Wendl. 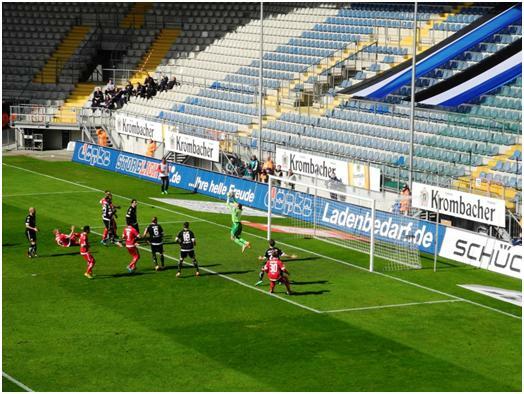 A long distance shot was parried by the home keeper and the loose ball fell to Wendl with an open goal in front of him. Somehow he mis-kicked and it went high and wide. Stadlau’s chances were not helped when Wendl’s strike partner, Arben Selami received a second yellow card in the 56th minute, and the team were reduced to playing 4-4-1. Still they did enough to keep out the home side for home the eventual 0-0 draw will not be seen as a hindrance to their title ambitions. SO I was left with a quandary –should I return to Wiener Neustadt the next day and hope the weather did not intervene again, or should I stick to the original plan- a fifth level game in Germany. 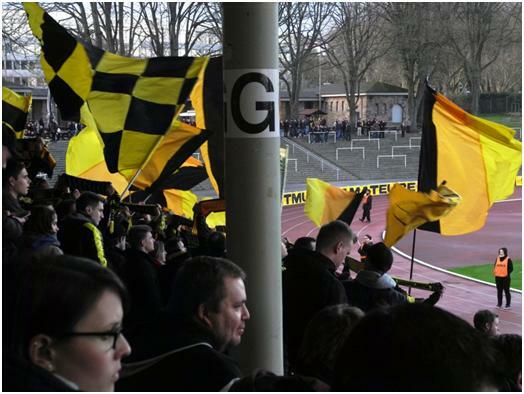 With the travel options out of the German game being poor, a late night train with seats only, while Neustadt offered a hotel and a connection starting at 10.30 in the morning, a phone call to the club early in the morning made up my mind. The pitch had recovered and unless there was (unforecasted) heavy rain, the game would be on. Wiener Neustadt translates as Vienna Newtown, and could fill the unwary traveller with fear based on the dull new towns in England, but of course, once the name Neustadt is given, it remains even though the town grows old. The town actually dates back to 1191, possibly the oldest “New Town” in Europe. 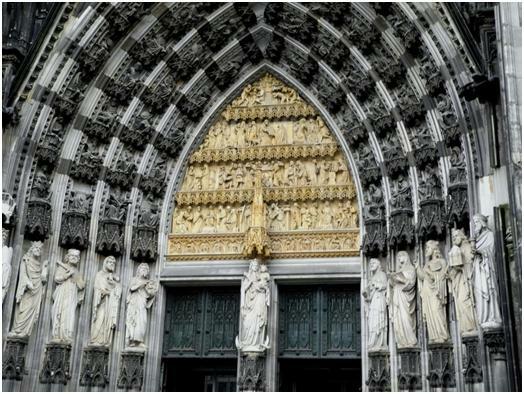 It was built up with funds procured by capturing (as they called kidnapping in the 13th century) the King of England (aka Richard I), and ransoming him. Little, if any of the town is that old, but its 18th/19th century heritage makes it a more than pleasant (if rather quiet) place to visit. 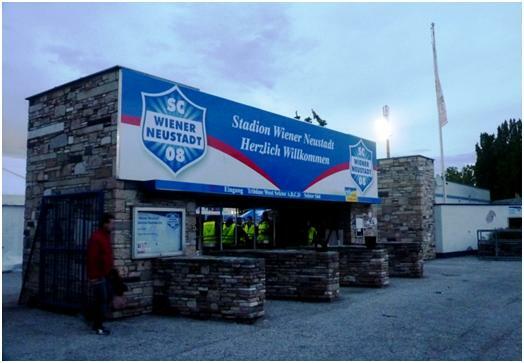 The unimaginatively named Stadion Wiener Neustadt (wot, can’t find a sponsor?) once had a track, but this had been covered by artificial grass. The main field is grass, (which was waterlogged 26 hours earlier), and slopes gently down at one end, the slope is not consistent and I think the worse puddles were actually near the top end. There is a long stand on one side, 8 rows of seats with a wide path at the top. They charge €15 to stand on the pathway, and €20 for a seat. They do not put in stewards to sort out who has the seating tickets. At the back of the pathway are food and drinks outlets and they have thoughtfully bolted a flat surface to the barrier between the standing and seats (with a slight wall as well), so you have a surface for your beer glass, (well beer plastic), and if you do knock it, it does not have to go all over someone sitting in the back row. The track was once surrounded in part with a grass bank, but much of this opposite the main stand has been concreted with seats put down, and a further seatng stand (the scaffolding type) had been placed square behind the bottom goal, mainly inside what remains of the track. All these seats are uncovered. One section of the side opposite the stand has been left as concrete steps, and fenced off for away fans. Only a small portionof the home fans chose the uncovered areas. And so, the battle for 8th place in a league of ten teams in which only one (Wacker Innsbruck) gets relegated. 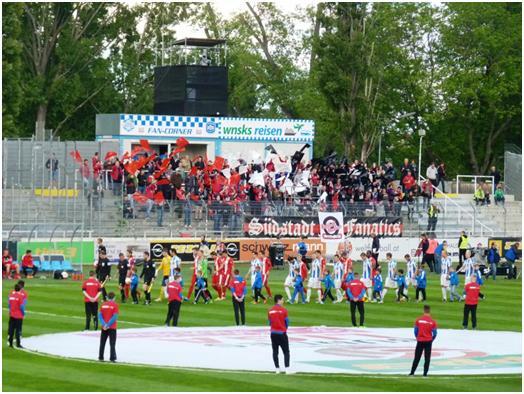 The match was billed as a local derby, although the two Vienna teams (Rapid and Austria) are far closer to Admira Wacker Modling’s Sudstadt Stadion. 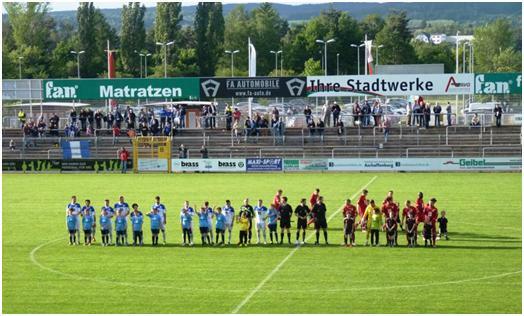 They do play in Niederostereich (Lower Austria), and not Wien itself, so there is some excuse for inventing rivalry. The game was a contrast of styles, the visitors were determined to pass their way through the home defence, while the home team were more in favour of fast moves, and route one. I made Markus Glanzer, the Neustadt goalkeeper man of the match. He made two critical saves at 0-0 and then got the assist for the opening goal. His long kick bounced twice, bamboozling a rather slow defender and allowing Thomas Froschl to lob the ball over the Wacker keeper. Wacker almost got back on terms, with a header against the bar from a corner, but Neustadt’s next corner was better, headed on to Froschl to score again. In the 42nd minute, Wacker should have pulled one back. Glanzer pulled back Rene Schicker as the midfielder tried to run around him. It looked foolish as the player was moving too fast and was unlikely to have been able to control the ball. Even if he had it would have been a difficult angle. Fortunately, the referee agreed with my thoughts and only gave a yellow card. Glanzer did not get anywhere near Stefan Schwab’s chipped penalty. Not many players try a chipped penalty – although it is guaranteed to go over a diving keeper, one that stands his ground has a good chance. The other thing, as we saw is what goes up comes down at its own pace – in this case bouncing off the bar for a goal kick! I still fancied the game had life. I just though Wacker were too good to be 2-0 down. Two corners early in the second half proved my point – 2-2! Between these, Frschl missed a chance to complete his hat-trick, and if a dangerous free kick from the right had found a head, then Wacker may have been 3-2 up. 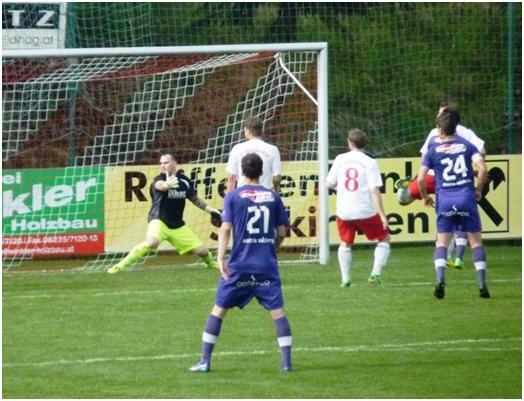 Instead, their defence parted again, the ball again fround Froschl and this time he did complete his hat-trick. Another excellent save from Glanzer kept the lead for Neustadt and Froschl now turned provider, crossing for subsitute Pichlmann to make it 4-2 in the 80th minute. Pichlmann then added the final goal with three minutes to play, and the season which had gone on 26 hours longer than intended was brought to a close. You are currently browsing the Football Shaped blog archives for May, 2014.